On Thursday, the Federal Communications Commissions voted 3-2 to override laws preventing Chattanooga, Tenn., and Wilson, N.C. from expanding the high-speed Internet service the cities already offer to some residents. The vote could embolden other cities that feel they have been underserved by traditional Internet providers, potentially undermining years of lobbying by the telecommunications industry. The FCC's intervention in Wilson, N.C. is even more dramatic, overturning a range of state laws that the city says artificially limits competition. One provision in North Carolina law bars cities from charging prices that are lower than the private incumbents'. Another requires municipalities to gain public support for a city-run service through a special referendum before borrowing money to fund such efforts. A third effectively prohibits cities from building in "unserved areas," according to Wilson's petition. Bolding mine. It's becoming almost impossible to keep up with all of the laws Republicans passed that have been blocked, overturned, or have come under serious scrutiny for Constitutionality. Any sane person would realize they were heading in the wrong direction with these facts staring them in the face, but the GOP is notorious for creating conspiracies of strawmen to explain their failures and poor judgment. They're going to have to raise taxes just to pay their legal fees for defending all their mistakes. "No more espresso shots for you!" “He said it’d be in our best interest to take it from the window,” she said. “And if we didn’t, we’d lose his business, and he’d make sure we lost other people’s business as well.” Addison’s daughter filed a “communicating threats” complaint to the Sanford Police Department following Thursday’s ordeal. Good for her, and shame on Womack for making the threat at all, much less to the daughter instead of the owner. Didn't we used to have a "Jackass of the Week" award here? Well, he wins it hands-down. After the meeting Ross and Board Chair John Fennebrusque met with reporters in one of the most bizarre press conferences you will ever see, with a combative Fennebrusque unable to answer a basic question asked by reporter after reporter; why exactly was Ross forced to step down. Fennebrusque said it had nothing to do with his performance, the joint statement said that too. Fennebrusque said he was very pleased with Ross’ efforts for the UNC system, that he had been doing a wonderful job. And Fennebrusque said it had nothing to do with politics either, the hardest answer of all to believe given the rumors about pressure on the board from legislative leaders to make a change. I think a lot of people still haven't grasped the fundamental truth about Republicans: Once you have achieved the power to do something like fire a University President, you no longer need to explain yourself when you exercise that power. Aside from the fact it's difficult to justify the unjustifiable, providing reasons for your actions is a sign of weakness, and inevitably leads to an erosion of your power. And this is why they make so many embarrassingly foolish mistakes; because they don't adequately scrutinize their own ideas before putting them into practice. 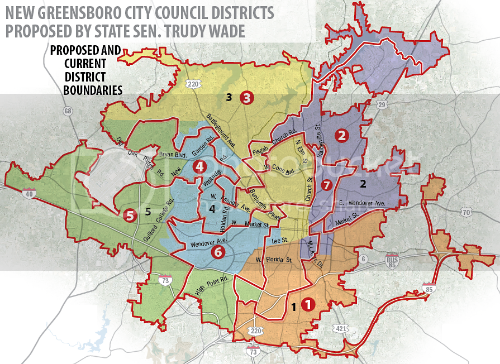 When asked if he would favor legislative changes in the makeup or size of the Greensboro City Council — something Sen. Trudy Wade (R-Guilford) said she is considering — Berger said he would be interested to see what Wade proposes. And what are some of those reasons, pray tell? Neither you nor Trudy Wade have revealed to the public anything more than vague mumblings, which means this is not a populist move, it's something else. And that something else needs to be revealed to the people of Greensboro, before you attempt to stifle their voices. If the city had six or seven council districts, the maps could be carved up in a way that overloads a handful of districts with Democrats, making the remaining districts at least more competitive for Republicans. The General Assembly used both of those techniques — eliminating at-large seats and clumping together Democrats — when it redrew the county commissioner districts. The younger man, whose name was not immediately available, was taken to the hospital with injuries that were not life-threatening. Phil Cowherd III was interviewed at his home but was not taken into custody Sunday, Hunt said. Deputies have collected the gun used in the shooting as evidence.